Born on May 6, 1904 in Benevello d’Alba in Italy, Maggiorino Vigolungo was raised by a humble and devout family. Smart, cheerful and with a natural inclination to excel in everything, young Maggiorino desired to become a saint quickly, to become a priest, and to be an apostle of the good press. 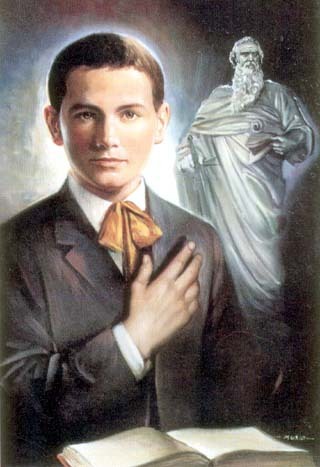 Having chosen Father Alberione as his spiritual director, on October 15, 1916, at the age of 12 years old, Maggiorino entered the Society of St. Paul. O Father, I thank you for having called the young Maggiorino Vigolungo to spread the Word through the “Good Press”. You have infused in him a lively desire for holiness and a great love for the apostolate of social communication as to offer his life for it. I beg you to glorify this apostle in your Church, as a joy and model of children and young people, so that his examples may influence in a Christian way their choices in these times characterized by global and multimedia communication. Through the intercession of Maggiorino, grant, dear Father, the grace I now ask… Amen.